The Reserva classification on a Rioja wine label (and other Spanish wines) indicates that the wine has spent at least three years maturing; at least one year is spent in oak barrels and at least one year spent in bottle. That oak is usually American which imparts the traditional ‘leathery’ flavours to the wine as well as a brick-coloured hue. The more modern style Riojas, which can be drunk younger, are cherry red and more fruitier on the nose and may not have spent the three years maturing. The Baron de Chirel we tasted belonged to the traditional style of wine. It looked opaque, almost black, in colour but the rim of the wine had a definite brown tinge; there was plenty of viscosity left clinging to the glass. The nose had a wonderful spicy bouquet overlaid on vanilla with some refreshing acidity present – an intriguing mixture. The bottle had been opened for 48 hours but had lost none of its fullness but Richard observed that the fruit sweetness had been lost. It had a drying, tarry finish. It was throwing a small sediment. We drank two glasses without food but food (a lamb dish, hard cheese?) would have improved, and been improved, by the match. Gewurtz has for many years occupied the coveted number one position in my ‘most hated grapes list’. I don’t think I’m alone in this and recall attending a tasting recently – people paid for entry – where the only unfinished bottle was a gewurtz from South Africa which I wouldn’t recommend to anyone. Anyway, on the trip to Alsace I tasted a few and found I liked them. Simple reason – they don’t taste much of gewurtz. At least, the gewurtz we get over here. 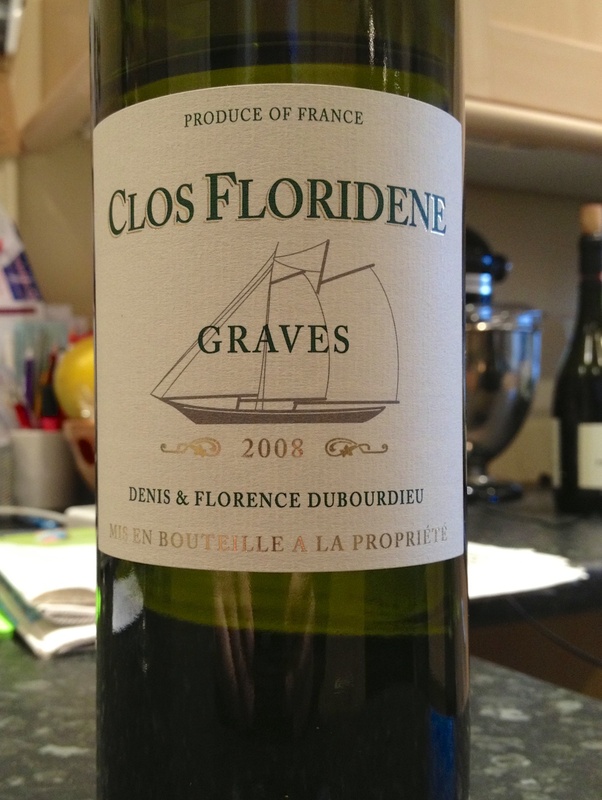 This is from a very well respected co-op and is made from late picked or vendage tardive grapes. About €15 for 0.5l which sets it apart from most supermarket stocks. We drank it with foie gras and then Munster cheese, both from the region and they were a perfect match. The wine is deep yellow, bright with some viscosity, spicy, some muscat flavour and honey flavours, weighty in the mouth with a balance of sweetness and acidity. A terrific drink and I’m a convert. 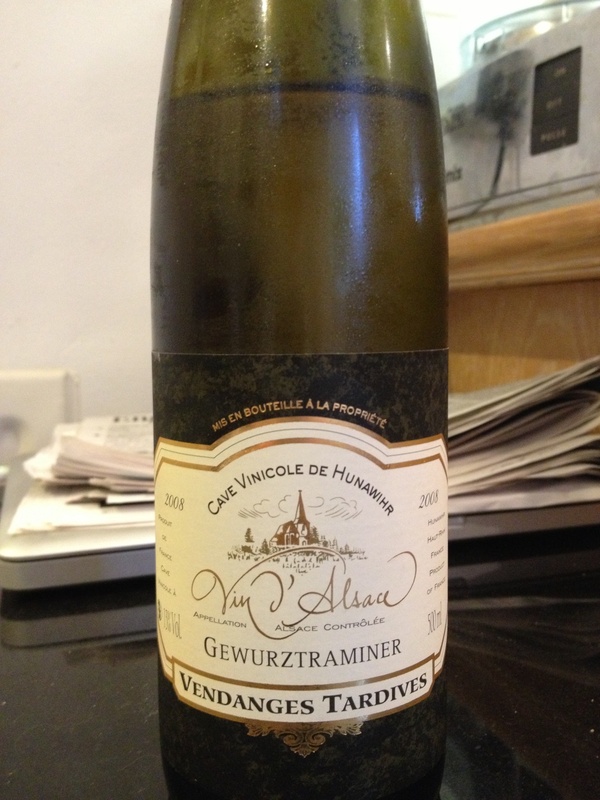 [Note by Geoff]: I’ve always liked Gewurz. but the Alsace tastings took the wine to a different level. The flavours were more pronounced and there was the clean finish that you don’t taste with the generic versions in the UK. I’m sorry Richard now likes it – no more of his hand-me-downs, unfortunately. Wine and good value. Part 1. As a precursor to a tasting of similar wines at different price points (as prompted by a follower’s comment) I list below a breakdown of retail price points and their duty and VAT elements – for still wine, 75 cls. As you pay more for your wine, the less the government take as a percentage of the total cost; the point has been made many times. This does not, however, always mean better quality wines at higher prices as there are many in the chain of supply who take their profit margins for growing, making, distributing, marketing etc. It does mean, however, that lower price points mean less is available for all those elements. One outcome may be that economies of large scale production become important and the quality of the wine may suffer or at least become one-dimensional. Some of our forthcoming tastings will be aimed at commenting on this factor. Spain – old and new. An independent wine merchant recently commented to me on the move away from the traditional, more oaky, style of Spanish white wines to fresher, lemony wines. In our conversation we both expressed a preference for the previous style and agreed on the tendency of the newer style to appear bland and characterless. Broad statements, I know, but I wonder how many of our mass of followers feel the same. Anyway, it’s always comforting to have one’s prejudices confirmed. 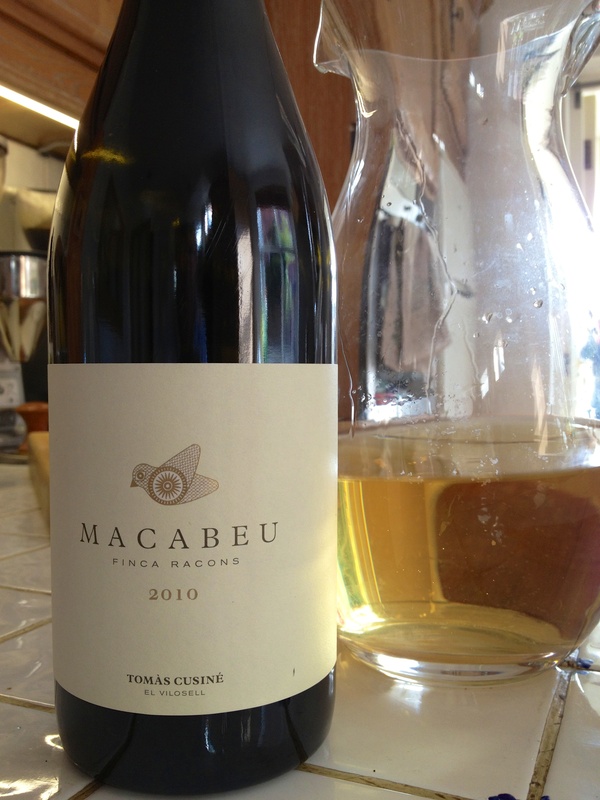 All that was by way of introducing the Tomas Cusine Macabeu Finca Racon 2010 from the Wine Society. At £14.95 it wasn’t cheap but worth every penny. As recommended, we decanted it 90 mins before tasting – how often does white wine repay you for doing that. It was crystal clear in the glass, with viscosity very evident (14.5% ABV). The colours were lemony yellow with a slight green tinge. On the nose it had acidity which gave it an appealing freshness but the overarching impression was one of depth and power. The mouth feel was silky and soft, the flavours of almonds and marzipan very full. It ended dry with slight salty notes. It was a great food wine – we had it with smoked mackerel, steamed potatoes in a mustard vinaigrette and rocket – not flavours for the more faint hearted. This wine stood up to them. The wine comes from a very small D.O. region in north-east Catalonian Spain called Costers del Segre, close to the more well known Priorat D.O. This particular producer’s Macabeo comes highly recommended, probably because the production is only 4000 bottles. I have one bottle left and have asked the WS if they intend re-stocking it. A super Spanish white in the traditional style. I have to admit a passion for Bordeaux whites. Graves and Entre-Deux-Mers were the first white wines I remember tasting, really enjoying and subsequently investigating where they came from. This was in my very early twenties, so to impress a beer swilling rugby player they must have been notable – to me, anyway. I think Bordeaux whites were a lot more popular then, as the fashion has moved away from the broader, less acidic, flavours of the semillon grape to the more sharply defined sauvignons. This wine contains both grape varieties, though there is no indication of the proportions on the label. The Wine Society web site states that the semillon is grown on limestone and consists of old vines – presumably to give more intensity of flavours. It cost £14.95 . To look at, it was a very bright and clear greeney-gold with some viscosity on the sides of the glass. The nose changed the longer it was left in the glass, initially having obvious floral qualities changing to more oaky/vanilla notes with a lemon acidity as the balance. We both thought the nose ‘weakened’ slightly during the tasting. 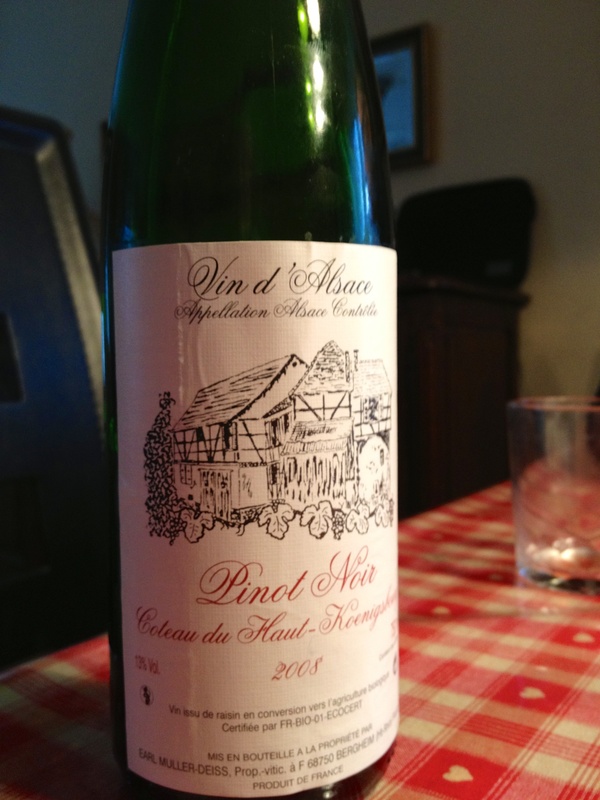 The palate was dry, with high acidity initially; there was an attractive edginess to the wine. However this lessened as the wine developed and the lower acidity, fatter style of the Semillon – and the vanilla notes – came through. Richard thought the wine had a hard (mineral?) finish; it was certainly of medium length. We were glad we drunk this wine when we did (we had it with sea bass and asparagus) and didn’t think it would improve. Personally, I still like this style of white wine which I liken to old-style white Riojas with their lower acidity and vanilla flavours. Footnote: web search found that the blend was 40% each of Sauvignon and Semillon with 20% Muscadelle. This grower, based in Bergheim, sold us two bottles of Riesling from his 08 vintage – a great opportunity for comparative tasting. The first, Buehl de Bergheim, was 12% ABV, the second, Pflaenzer de Bergheim was 11.5% ABV. Both wines were very faintly yellow to look at, clear, with a little viscosity on the side of the glass. Their aromas were also identical, being slightly raisiny with forward, fruity noses of some acidity. The palate of the Buehl was mouth-wateringly dry, high in both acidity and minerality, light and really refreshing – great with food (in our case, a cod/fennel/potato dish). 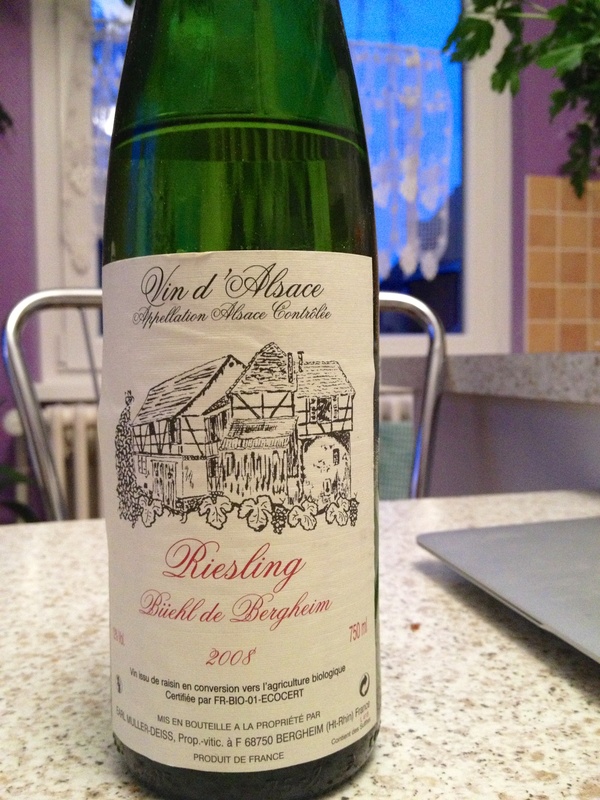 The Pflaenzer tasted very slightly sweeter, but still with the refreshing acidity balance, and not as minerally. Another great wine. Both wines were steely, rather than luscious, and for €8 were excellent value as light, everyday Rieslings. We’re spending a week in Colmar in the Haut-Rhin area of Alsace where the weather’s cool with little sun but no rain. 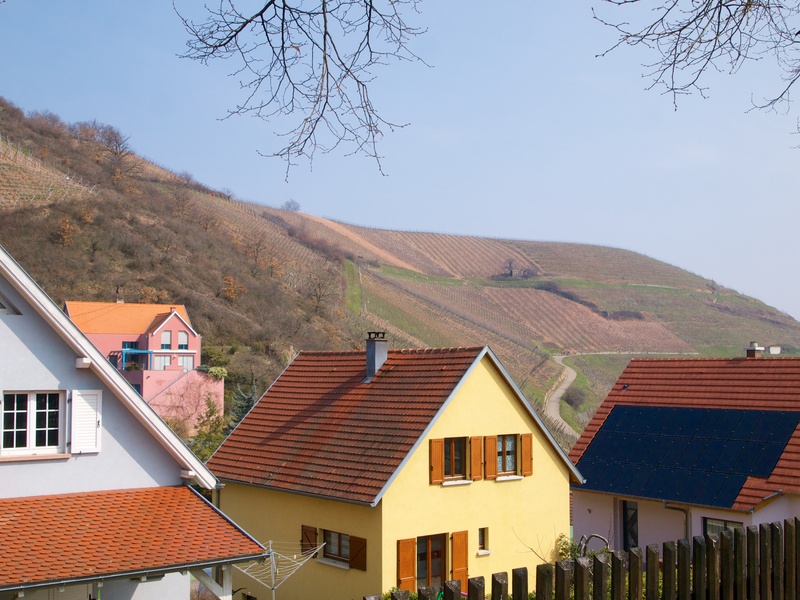 The photo shows vines on the hills at Niedermorschwihr, where Albert Boxler is based. Bare and obviously well-tended, the vines surround the roads on the flat plains. The higher, and better, slopes of the Vosges seem almost inaccessible to the casual visitor. Here, vine nurturing is a hard job on these south facing inclines. The vineyards are bounded by woodlands, which must have been cleared at some point in the past to make way for the vines. Turning over the soil, establishing the posts and wires, planting, pruning and harvesting the grapes are all done on steep inclines – the physical demands of keeping these top quality vineyards are plainly obvious and explain why the better wines are more highly prized – and priced. Wines purchased from the vineyards all seem to start at €8/9, then move to €11-13 and upwards to the Vendage Tardives – depending on the grape variety. Rieslings and Gewürztraminers dominate the higher prices but most growers sell all the other wine varieties. It would be interesting to know how many growers just supply grapes for the wine makers (a la Champagne region). Those are the only two, small, negatives so far as most of the wines we’ve tried have been wonderful in their balance of fruit sweetness and acidity. Generally the wines have a restrained power and complexity of flavours that are unique and difficult to reproduce in other parts of the world. They are certainly worth the prices we are paying.